My copy: paperback, ARC from Janice — thank you! I think the common thing about all the zombie novels I’ve read and reviewed (The Forest of Hands and Teeth, The Dead Tossed Waves, Feed and Z) is they’re all post-apocalyptic novels. The zombie apocalypse has happened, and I’m brought to a setting where I read about how the people coped, is coping and will cope with the reality that zombies are among the people. Some books are set early enough after the apocalypse that the characters still remember why and how the zombies rose, while others are set so far off into the future that no one really knows how the zombies came. What sets Married with Zombies apart from the other zombie novels (aside from the pink in the cover) is how it’s set during the apocalypse instead of post. Everything was normal for David and Sarah up until their marriage counselor tried to eat them, and from there everything goes haywire. I find this setting quite creative because I’ve never read a zombie book that focused exactly on how people tried to survive as the zombies came. There’s a certain sense of the unknown in this, and I got to see fresh terror and denial from the humans as they wrestled with this new and terrifying fact of life. I found myself rooting for the characters to survive because…well, who else is there to root for? However, that’s pretty much what I found unique in this book. 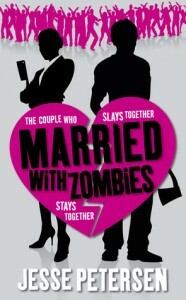 I think the real selling point of this book is not that it’s a zombie novel, but the romance/chick lit aspect. Yeah, the chick lit aspect is there, but it’s not the same chick lit aspect that I’m looking for in those I read. I think I agree with how other reviewers viewed Sarah — she’s kind of annoying. She did admit she was a Type-A person, but I never really felt much sympathy or connection with her. David seemed too much like the typical guy who turned out to be a hero, but I’m also kind of lukewarm to him. Come to think of it, I don’t think I really connected with most of the characters here. Normally this is an issue for me, and it is kind of one here, but somehow I think the zombies managed to make it up for me. The love angle is kind of cheesy, really, and there’s nothing too special about it. I am glad that they worked out their marriage even if it took a zombie apocalypse to mend their marriage. Which brings me to the point that a relationship will work out if you have a common goal. I’m not so sure how sound zombie busting is as a common goal will work, but well, I can suspend my disbelief. I think the most surprising part in this novel — at least for me — is the gore. For some reason, I felt extra queasy with this novel as I read it. There’s so much blood and gore and guts and black sludge (ew) in this novel that I found myself grossed out for the first time in a zombie novel. Remembering it now is still kind of making me queasy. Eh. Overall, it’s not a bad zombie book. It’s not the best one either, but I’m still willing to give the second book, and maybe the third book a chance. I would love to read David’s point of view, though — I hope we read that in one of the future books? If you’re a zombie fan and you don’t mind reading something “light” in terms of this literature, go and pick up Married with Zombies. Don’t expect to be wowed, but it could provide some mild entertainment. However, if you’re just starting out in the zombie fad, I would recommend you to get other more established zombie books before moving to this one.